Thomas Woolley was born in 1809 in England, the son of Thomas and Mary Honoria Woolley. He married Eliza Pilmor in England in 1835. Alderman Thomas Woolley’s residence at Glebe in the 1840s was Hereford House. Fellow Alderman Ambrose Foss had lived there in the 1830s. He died on 18 February 1858 at St Leonard’s-on-Sea, Sussex, survived by his wife, son and two daughters. There are also burials in Camperdown Cemetery, Sydney, for several people named Woolley, including Thomas and Eliza. Woolley arrived in Sydney on the Florentia in January 1834. With his brother Michael he opened an ironmongery business in the Birmingham and Manchester Warehouse in George Street. He returned to England in 1835 and brought his bride back to Sydney in the Tamar in September 1836. In 1842 Thomas and Michael Woolley were advertising for a gardener, coachman and cook for their George Street premises. They opened a new show room in King Street in November 1844, selling meat covers, wire safes, zinc safes, and candle cotton. They also exported whale oil and local produce. In 1844 their tender to supply the Colonial Service was accepted and they provided ironmongery for the overland expedition to Port Essington. 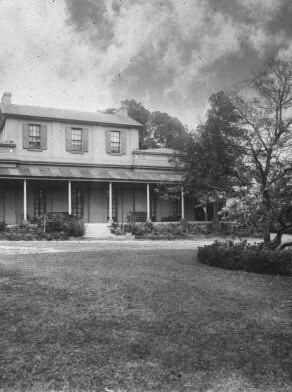 Woolley’s private residence at Darling Point was PercyVille, a Gothic Revival house built for him in 1841. Woolley had bought part of the Glebe estate in 1828 and by the late 1840s he was living at Hereford House in Glebe. About 1850 he sold his successful business to Tomlins & Sloman. He returned with his family to London and retired to Regents Park. Later he moved to the Victoria Hotel, St Leonard’s-on-Sea, Sussex. In 1850 he published Reminiscences of the Life of a Bushman: or, how to make happiness, abundance and profit, the results of emigrating to Australia. Woolley was a Director of the newly-formed Australian Gaslight Company from 1837 to 1840 when he went back to England. On his return to Sydney in March 1842 he was appointed treasurer of the Sydney Dispensary. He was a member of the committee that petitioned for the importation of Indian coolies to New South Wales in 1843. He was Church of England. Thomas Woolley was elected Foundation Councillor for Cook Ward, 1 November 1843 until his resignation on 19 February 1844. ‘Woolley, Thomas (1809–1858)’, Australian Dictionary of Biography, National Centre of Biography, Australian National University, http://adb.anu.edu.au/biography/woolley-thomas-2815/text4031, accessed 22 November 2012. Fitzgerald, Shirley & Golder, Hilary 1994, Pyrmont & Ultimo: Under Seige, Hale & Iremonger, p. 45.